Yesterday I was tearing out my hair in frustration over my revisions. I struggled with a couple paragraphs for hours before finally calling it quits. I was in a pretty foul mood. Today I returned to those paragraphs and am happy to report that the words cooperated. And I didn’t even have to bludgeon them into place. Even better news is that I then spent the rest of the day going over the entire manuscript and am now ready to send it to a brand-new reader. Do you know what this means? This means I am five whole days ahead of schedule! FIVE WHOLE DAYS, people! 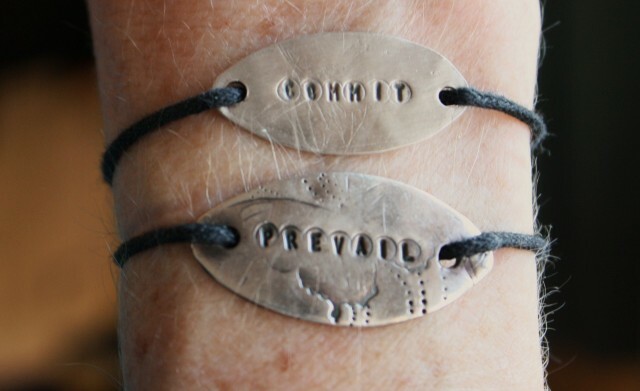 Bracelets made by Laura Hamor of Silver Freckles. Find her on Etsy. What’s the key to my success? As always, it comes down to two little words.